I badly needed a ‘bhatanki-break’ to kill my boredom. On saturday night, I started hunting for a place to drive and suddenly ‘Lavthaleshwar’ stuck my mind. Actually ‘Lavthaleshwar’ needs to be clubbed with Jejuri as it is 1-1.5kms just before Jejuri but i had not been there earlier in my Jejuri visits. It is known to be an ancient cave temple of Lord Shiva. I felt keen desire to visit here. I got up early in the morning and took up Solapur highway. Drive up to Hadapsar and take right turn to Saswad. 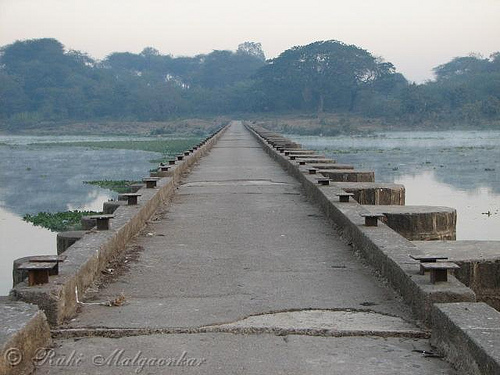 On the way to Saswad, you have to cross Dive ghat. From Saswad, take road to Jejuri. 1.5 kms before Jejuri, look for ‘Lavthaleshwar’ temple entrance on right hand side. Total distance from Pune is around 48 Kms. It is good drive of around 50 kms to reach the temple. Amazing fact about this place is – the temple is underground and not easily seen from road side. I parked my vehicle near the entrance name and literally searched for the temple. Later found some deep steps leading to the temple door. I descended and found this cave temple. Another unique thing about ‘shiva-linga’ was, it was placed perpendicular to the entrance of ‘gabhara’. Mostly shiva lingas are horizontally placed in ‘Gabhara’. Being cave temple, it was cooler inside. I bowed in front of almighty and sat in peace. I generally like to visit temples in off-season where in I can spend my own sweet time there and conversing with God in leisure. This time it was exactly same. Then I came outside the temple and spent some time observing the surroundings. It was peaceful and shady. It is said that Swami Ramdas on the way to Jejuri halted at this temple overnight. He composed famous Pooja Arati – “Lav lavathi vikrala brahmandi mala…” here derived from the name ‘Lavthaleshwar’. I started my return journey, took a ‘Misal paav’ break in Saswad. It was good drive of 60 odd kms and the place was worth visiting. I visited “Morachi Chincholi” for second time last weekend. From learning from last visit, this time we started very early morning at 5:00 AM. I had my friend and her family along with me. They were very keen to see this place and we made a plan. After reading my earlier post on “Morachi Chincholi“, a young chap called “Tanmay” from same village was very much excited that I wrote about his village and then we got in touch through mails. He insisted that I should visit his home when I go there again. He has also launched website to promote this specialty about his native. I became his critic to make his efforts better. This time I had company of Tanmay’s cousin “Dattatraya” in exploring more peacocks. Datta invited us for breakfast and tea and I just couldn’t deny his offer. We went to his place. 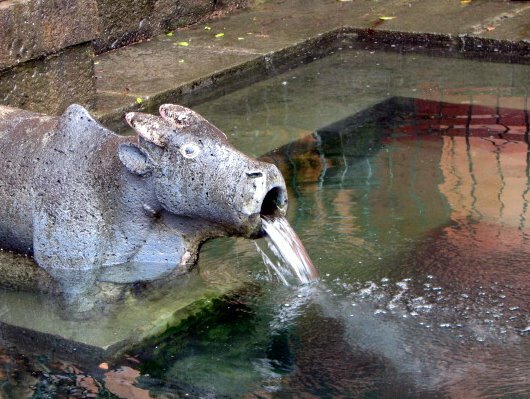 His house was simple and neat with livestock of cow, buffalo and bullocks. His mother made “Pohe” and “Kanda bhaji” for us followed by refreshing tea. We were overwhelmed by their warm welcome and hospitality. While returning Datta gifted us with peacock feathers as memento. I said to myself that this is not the last time and many more visits are on my mind. I strongly believe that there are some knots tied somewhere among the individuals which make us to meet different people in our life. I am happy that my path has crossed many such in my life. Disclaimer: Friends, I recently got a comment that someone visited Morachi Chincholi and was unhappy that ‘Datta’ didn’t help/entertain them. Let me make it very clear that ‘Datta’ or people alike, whom I met are simple villagers who don’t have any travel company to entertain visitors like us. Nor do they do it for money. It is just for sake of relation and love that they have with me. I am thankful to them for that. I highly disclaim here that do not visit Morachi Chincholi or any of the places with expectations that ‘Datta’ or any villager(s) whom I wrote about, will help/entertain you. 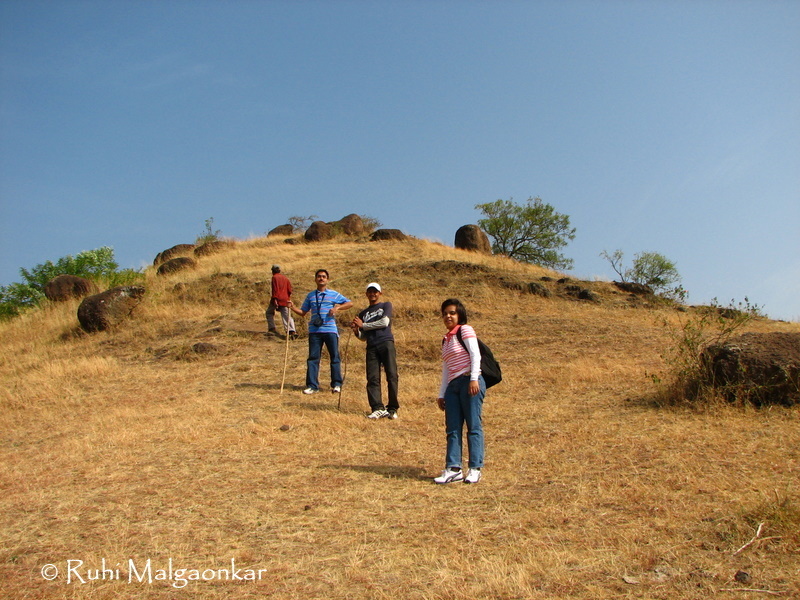 I myself have visited many remote places around Pune without knowing anyone there. Intention of my blog is not to provide you assistance for site seeing and food. My sheer objective is to provide detailed information about routes, place and share my own experiences. ‘Ghorwadeshwar’ (मराठी: घोरवडेश्वर) was on my mind since quite some time. Last Sunday, I visited this place with one of my friends. We got up early in the morning and drove to Ghorwadeshwar base. We parked our vehicle there and started climbing the mountain. Start from Pune and take old Pune-Mumbai highway. Cross Dehu, Shelarwadi to reach village called ‘Somatane’. On left hand, you will see entrance of ‘Ghorwadeshwar’ and stone steps on the huge mountain. Total distance is 35-40 Kms. Note: Carry water bottle. Wear good shoes/floaters with good grip as path is steep and rocky. Strictly – no chappals, fancy footwear, sandals. Total 11 caves and many water tanks date back to 3rd or 4th century. There is a Chaitya gruha which has 3 small rooms dug on left side, 4 on right side and similar 2 on back side. The main stupa is now turned into ‘Ghorwadeshwar’ temple. The sabha mandap is big to accomodate devotees. The Gabhara is extension to it and has no door. I found the shivlinga quite unique in shape from the rest. The base of this shivlinga is squared and not circular in structure. Some of the wall has carved messages in Brahmi lipi. The panorama of Shelarwadi, Dehu, Talegaon, Somatane was on front side and on back side there were traces of concrete jungle in Hinjewadi. We sat on the rock for some time to figure out these places with our bino. 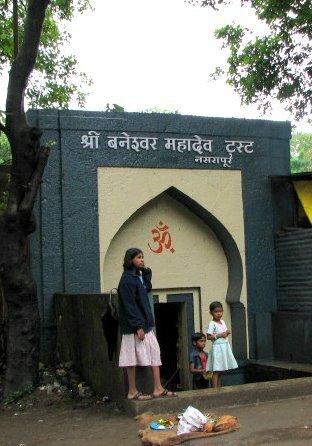 On the left hand side there is another cave temple dedicated to Saint Tukaram. 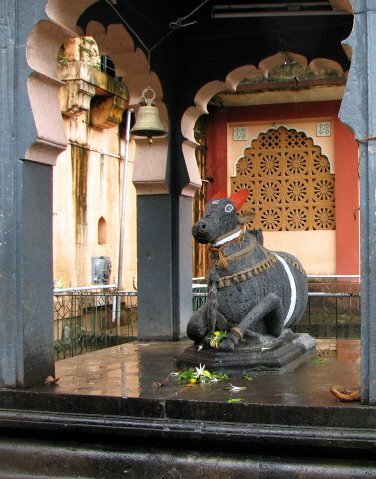 Three beautiful black stone idols of Vitthal, Rakhumai and Tukaram are installed here. Ghorwadeshwar trust was formed in 1981. There is huge yatra here on ‘Mahashivratri’. Thousands of devotees climb up to take darshan on this auspicious day. I have been to Kavdi (also called as “Kavdipat“) for couple of times. Each trip is a treat in itself. We started for Kavdi at 6:30 AM. After crossing ‘Loni Kalbhor’ toll plaza, we traveled for 2 mins more and took left turn. We found Bush chat (Female) and clicked few snaps on the way. We could also spot a Honey Buzzard along with Bulbuls, Shrikes, Drongos, etc. Start from Swargate and take Solapur highway. After crossing this Toll plaza, drive 2 mins more to see “Kavdipat” sign board on left hand side. Take left turn to go to Kavdi. After distance of 10 mins drive, we reach bund and river at Kavdi. You can park your vehicle at temple near by. Total distance is approx 20 Kms. Best season to visit: November to January. Flocks and flocks of migratory as well as local birds make their way to Kavdi. Winter mornings are very pleasant. If you reach there at time of sunrise then you could get some awesome sunrise shots. We climbed the bund and fun began. First there were Wire-tailed Swallows. I approached them closer and closer and they were all set a wonderful photo session. Other birds found were – White-throated Kingfisher, Small blue Kingfisher, Teals, Brahminy Ducks, Ducks, Marsh Harrier, Yellow Wagtail, White-browed Wagtail, Grey Heron, Spotted Sandpiper, Black Ibis, Spotbill Duck, Cormorant, Darter, Common Sandpiper, Large Egret, Spotted Ducks. A special mention about a bird called “Blue Throat” which flies all the way down from Europe and then north Asia to this place. I saw it for first time. Thanks to Vishal for showing this to me. On the way back, we waited at “Joshi Wadewale” and took a “Wada-paav” break. I returned home with memories of all these wonderful flying beauties. I visited ‘Ananda Valley’ with my colleagues last saturday. It was a more of a team building activity than a picnic. We gathered near our office and started at 8:30 AM. Best thing I like about Pune is – as you drive few kilometers away from city immediately the scene changes, you can breathe fresh air and enjoy nature. It was bit of cold and pleasant atmosphere in the morning. On the way, we enjoyed some garama-garam pattice which I got from Hindustan bakery. Take Pune-Nasik Highway, Cross toll entry (take return toll of Rs. 31.50/-) at Moshi. After Exit look for 2 petrol pumps (BP, HP) on the left side. Take left after the 2nd petrol pump take the road that goes to Kadus village. You will leave the highway at this point. Drive more 10 kms to reach Kadus village. Ask for Dr. Kataria’s Farm i.e. Ananda Valley. After 1 km, look for sign on your right. Total distance is approx. 50-55 kms from Pune on Nasik Highway(NH-50). We reached there at around 10 AM. Our booking was already confirmed and the concerned person explained us the details about the activities of the day. There were many other groups from different IT companies. We had breakfast which consisted of Pohe, Upma, Kokam Sharbat, tea, coffee and farm-fresh bananas. By the time we returned, it was lunch time and we were hungry. 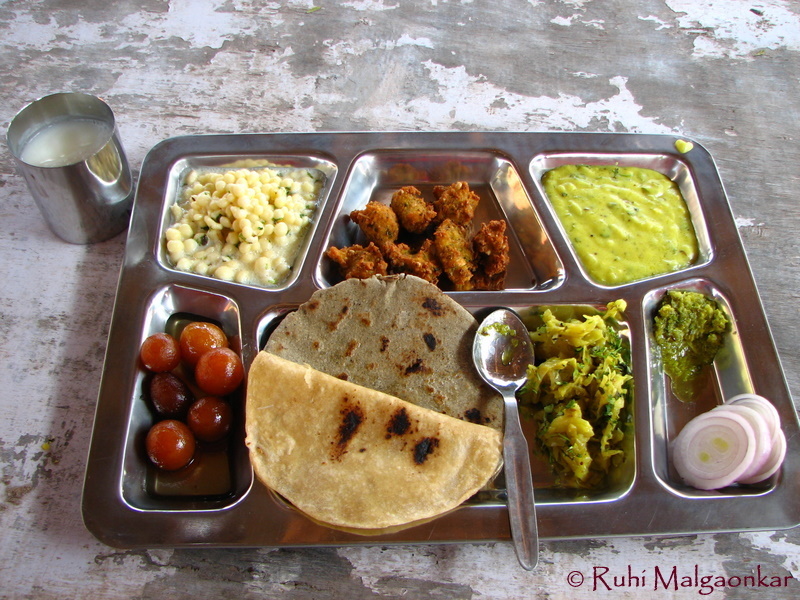 We enjoyed delicious Maharashtrian Thali (with Jowar Bhakri, Pithale, thecha and all that stuff). Then we took some rest. 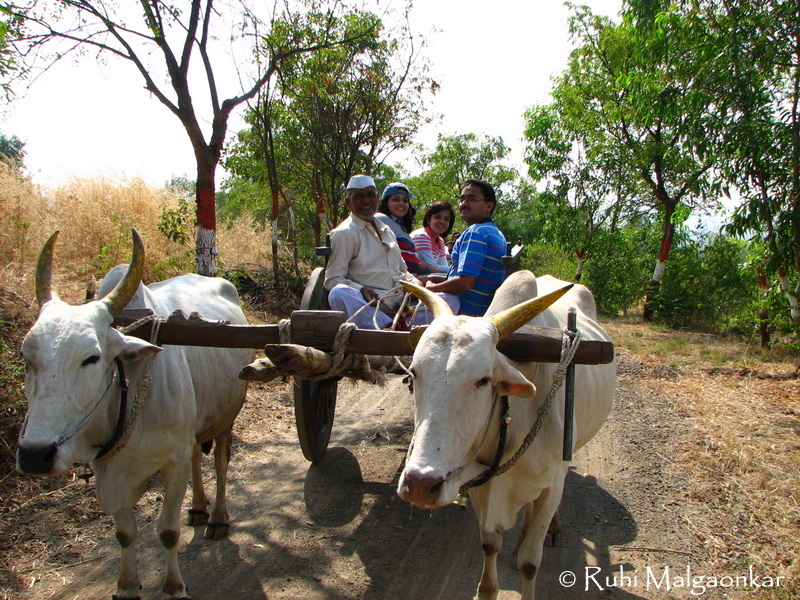 In the afternoon, we enjoyed a bullock-cart ride and also some tatoos and mehendis. We played few games of carom and Fuss ball. Magic show was on but we took no interest in it. It seemed very boring and we just ignored it. We didn’t indulge ourselves in any kind of actual team building-like tasks or games like other groups; the only reason was our group itself was small and other reason was, we just wish to relax. But we interacted more among ourselves. At end of the day, I felt I knew my colleagues more than yesterday and that was what it mattered for us. AV is better option for corporate picnics than a family outing. They now have accommodation facility for overnight stay for families. I still feel rainy season will be better to visit as it will be green. This is certainly NOT the place for bird watching and photography. + points: Nature, Food, Hill climbing, team building activities. – points: Less activities in the afternoon, no boating. My friends and I were planning for some monsoon outing since long. Finally we decided to go to Baneshwar last monsoon. We packed our backpacks and started in morning. There were light showers and atmosphere was very pleasant. Drive approx. 30-32 Kms to reach Nasarapur phata (function). You can see sign board on left hand. Take right turn from this junction. Drive more 2.5-3 Kms to reach Baneshwar. As the temple approaches, the dense canopy of bamboos welcomes you. This path is amazing. There is lot of parking spaces with few shops selling pooja thalis. Also there are few small hotels outside the temple. The temple entrance, deep malas, Nandi and water tanks are worth watching. Baneshwar has beautiful temple of God Shiva. This temple is founded by Shrimant Balajirao Peshwa in 17th Century. ‘Ban‘ means ‘dense woods or forest’ in Marathi language. 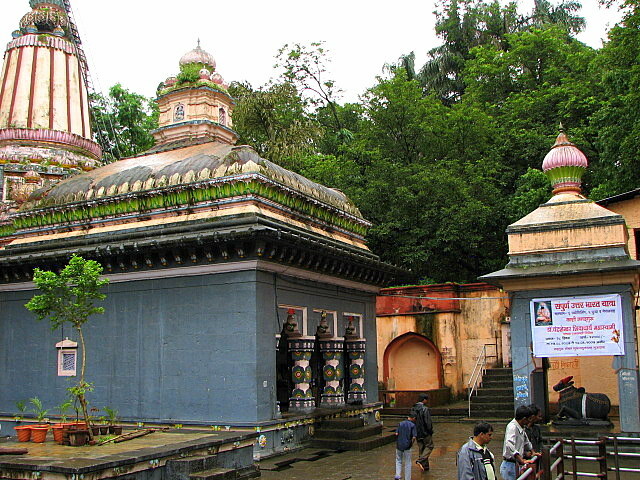 As this temple is situated among dense forest and trees it is called ‘Baneshwar‘ i.e. ‘God of woods’. 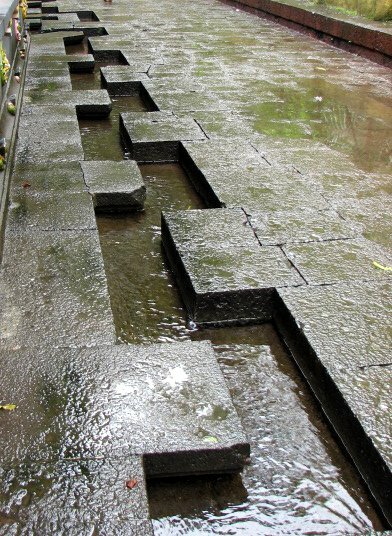 There is a unique flow of water around the temple. The construction is mostly in black stone. There are two water tanks with Gomukh. The water in those tanks is hard water. The gabhara has idols of God Vishnu, Devi Lakshmi and Shiva Linga. The surrounding is very pleasant and peaceful. Also there was a waterfall near to the temple. The route to waterfall is amazing and there is green all over. We should take precaution in waterfall as negligence can be dangerous. Baneshwar is becoming popular now-a-days due to its approachability and beauty. We really had great time at Baneshwar.